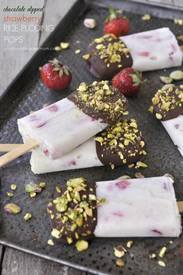 Chocolate strawberry rice pudding pops! One of my favorite frozen treats are pudding pops so I decided that rice pudding would make a fun and creamy popsicle. Of course the addition of strawberries and chocolate doesn't hurt! I then decided to give it a sprinkle of chopped of pistachios for a little extra crunch! Yum.